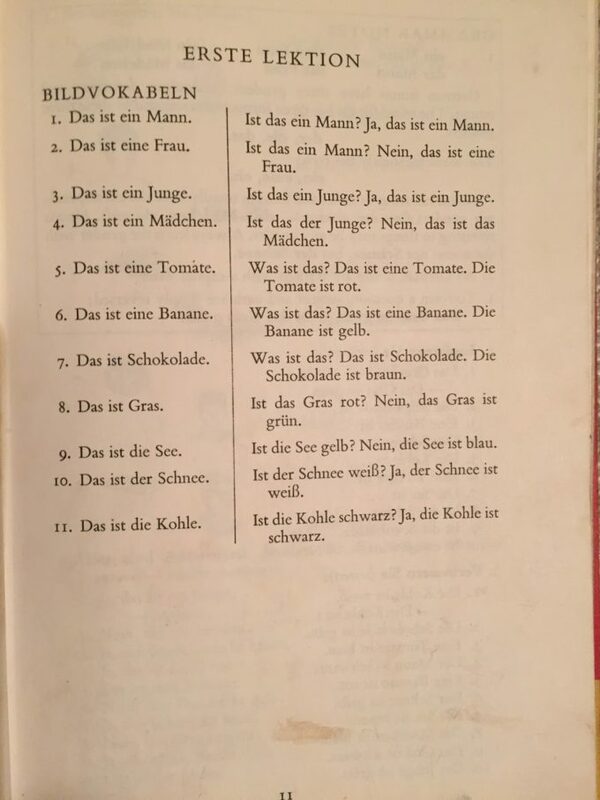 German textbooks: how they’ve changed! It’s easy to forget how much language learning has changed over the years, unless you think back to your schooldays. You probably spent five lessons a week with “La Famille Bertillon”, and got to know them very well. Longmans Audio Visual French? Le Francais d’Aujourd’hui? Jean Pierre est dans le jardin. Beep! 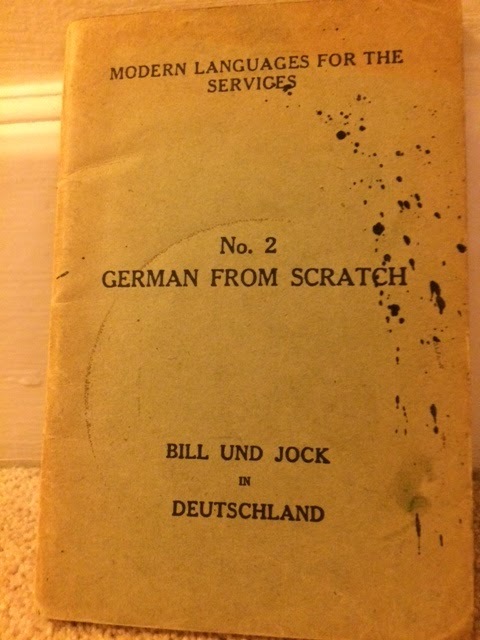 I’ve been looking at three old German textbooks: “Let’s Go to Germany” from 1933, “Bill and Jock in Deutschland” from the 1950s and “Sprich mal Deutsch” from the 1970s. Here’s one of the most unusual things I’ve come across in a second-hand bookshop. The book, by Anton Hermann Winter, is called “Practical Travel Talks in English and German: Let’s go to Germany”. He takes us on a train journey to Berlin with a couple called Mr and Mrs Trotter, who must be very wealthy to afford a 6-week trip like this. This is a dual-language book with text in German and English: a reader for those who already know some German. They follow this up with ice cream, cheese and fruit and coffee on the next page. No pre-wrapped sandwiches for Mr and Mrs Trotter. I wonder how expensive the train restaurant was and whether many passengers could afford to eat there. I’d love to have a proper meal on a train but this facility seems to have disappeared in the UK, apart from maybe in first class carriages on some routes. In Berlin we go with them to their hotel, shops, theatre, chemist, doctor…. And finish the holiday with a rather stilted visit to the zoo to celebrate Mrs Trotter’s birthday. Click here for another post in which I’ve shown an example of a French textbook from the 1920s/30s. 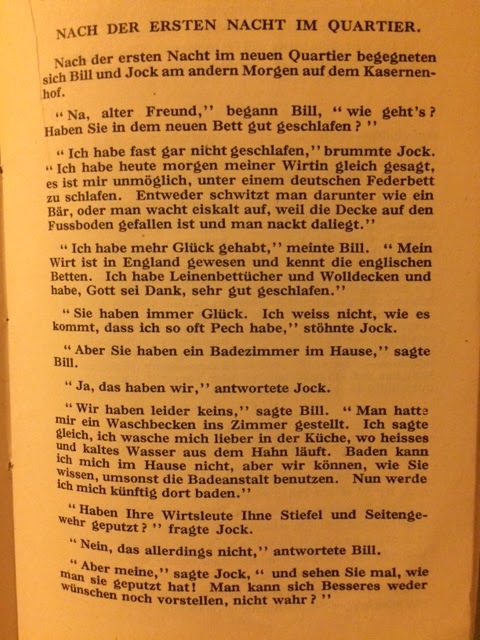 “Modern Languages for the Services: German from Scratch – Bill and Jock in Deutschland” – a textbook from the 1950s. This book was written just after the Second World War by an anonymous author. I assume he/she was serious about the names chosen for the soldiers. It’s not hard to guess where Jock comes from. It seems that the book was standard issue for members of the occupying forces stationed in Germany, as the aim stated at the front is “to enable the British soldier to make his way in Germany” and “converse with German citizens”. I wonder if it worked. The texts get progressively harder in the 15 chapters dealing with different scenarios. It would work if you were prepared to learn a lot of grammar and vocabulary in a short time. In chapter 9 the two friends are comparing the facilities in their relative digs. The Germans are pleasant and friendly and the men are keen to explore, but they have some issues with their accommodation. Jock can’t sleep because he has a duvet and it falls off him in the night. Bill sleeps very well because his landlord is more enlightened – he’s been to England and been converted to the good old British sheets and blankets we’d all find really uncomfortable if we tried them now. Bill has decided to get washed in the public baths rather than in the kitchen. 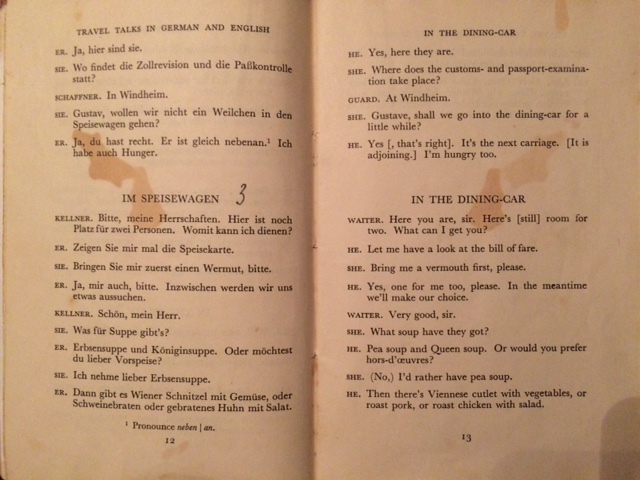 Jock warns him on the next page that German women are very particular about their kitchens, which are sparkling clean. It’s easy for us to forget that originally public swimming baths were the place to go to have a bath as well as a swim. Jock is very fortunate in that his hosts clean his boots and pistol for a small extra charge…. “Sprich mal Deutsch” (Just Speak German), a textbook from the 1970s and 1980s. “Sprich mal Deutsch” was a textbook familiar to most people learning German in UK schools until well into the 1980s. I think the author intended it to mean “Just speak German” so that we would expect it to be easy. Most of us had already been learning French for a year and thought at first that it meant “Speak bad German”. We still own a damp, yellow copy of this book which tells the adventures of the stereotypical “Ehlers” family. My husband retains a few phrases from it including “Julia geht ins Kino” (Julia is going to the cinema), “Die Sonne scheint” and “Spiegelei mit Bratkartoffeln” (fried egg with roast potatoes). In his case, a little vocabulary can get him a long way as he manages to find ways of adapting these expressions on trips to Germany, eg. “Die Sonne scheint nicht”. At the beginning of each chapter we were presented with a collection of largely unrelated nouns, and would turn the page to discover a little story containing all these words. Then there would be lots of “exercises” to do. Here are the first two pages of the book. I made a mess of my exercise book, correcting the exercises following this page. I’d forgotten that in German every noun starts with a capital letter, so I had to change most of the words afterwards. This was very annoying. With the first chapter there is no story, so the author’s choice of nouns for the first page remains a mystery. I assume he decided to write sentences which we would have no difficulty understanding, eg. “Ist das ein Mann? Ja, das ist ein Mann”. My inspiration came from looking ahead in the book and realizing that the texts which now looked like gobbledygook would eventually be meaningful. I’d discovered this from my experience of learning French, where all sentences on the first page of the textbook began with the puzzling phrase “Il y a” (for which my dictionary yielded “he there has”). I knew I would be able to decode all the texts by the time I’d finished the book, and that would be in the following summer if the French book was anything to go by. 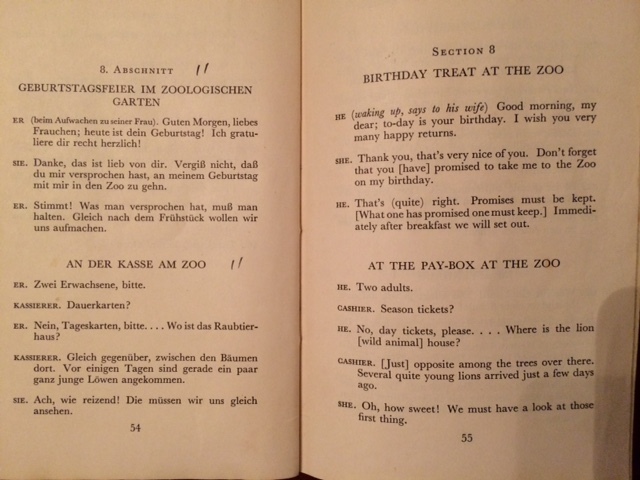 This book seems incredibly dated and funny to us now, but people did actually learn German from it. It did work! 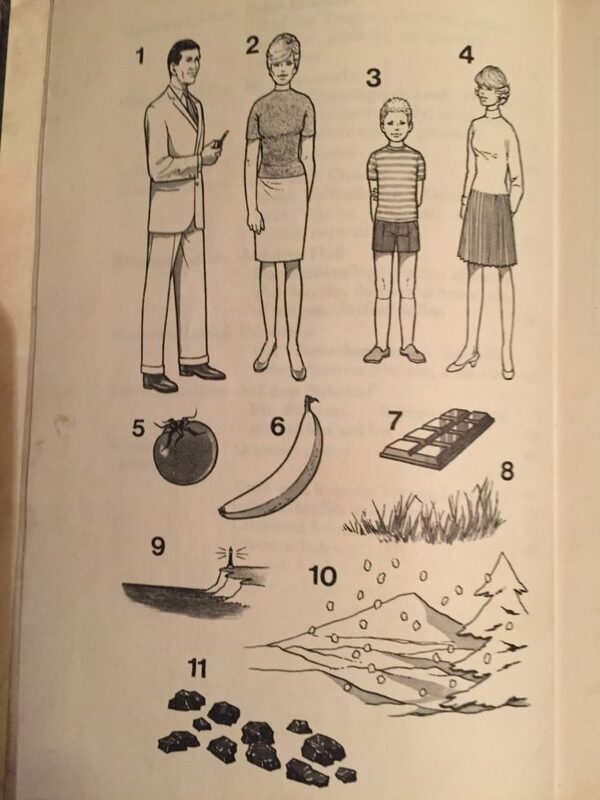 I expect most people can remember the language textbooks they learnt from at school: some stereotypical “families” and things which now make us laugh! Any more memories? I studied German at the Welwyn Garden City Grammar School in the 60s. Bill Rowlinson was our teacher, and he told us we were “guinea pigs” for a new German textbook he was writing. That book eventually became “Sprich’ mal Deutsch”! Bill was an exceptional teacher, extraordinarily student-focussed, and pomposity-free. His lessons were an oasis of sanity in the craziness of a baby-boomer secondary education. He went on to teach education at, I believe, Sheffield University, and pursue a stellar career thereafter, as we know. It’s people like Bill who are the real movers and shakers. Thank you for letting us know about your personal experience of “W. Rowlinson”, Martin! It’s interesting to get an insight into what he was really like as a teacher. Inside the textbook it does indeed say “Lecturer in Education, Sheffield University”.